Public art integrated with its location and the greater environment can animate public spaces and introduce artistic concepts and ideas to the community. Public art builds community vitality, identity, and pride. 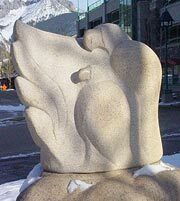 The Community Art Committee advises Council on opportunities to acquire and place public art throughout Banff. 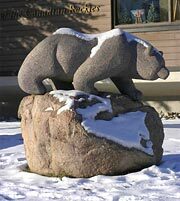 The bear Mistahiya (left) can be seen outside the Whyte Museum, while Sleeping Buffalo (centre) animates Central Park, and the beautiful Thunderbird (right) sits at the intersection of Lynx and Bear Streets. 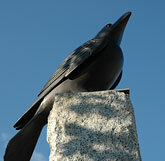 Steinhauer’s works speak to both Banff’s cultural history and our relationship with the environment. 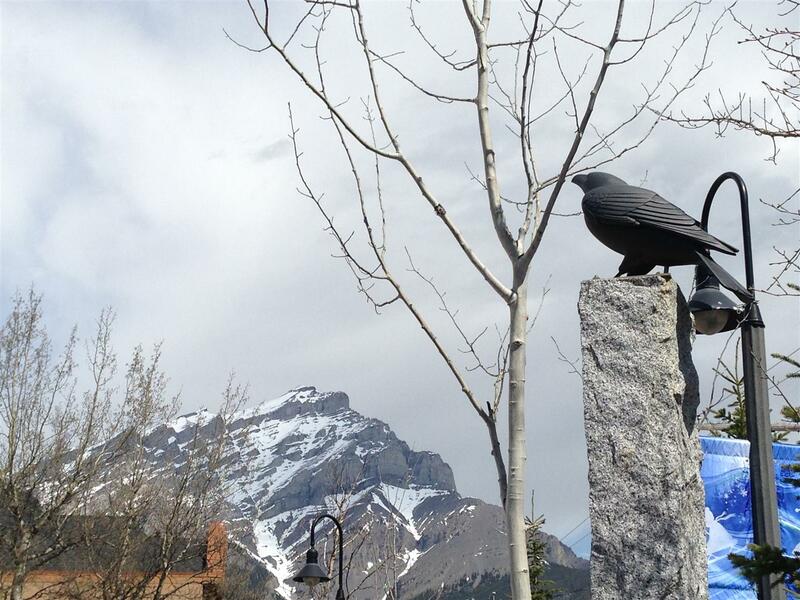 Four ravens watch passers-by from their elevated perches in Banff World Heritage Square, at 212 Banff Avenue. 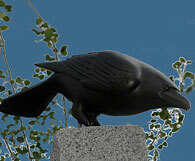 The sculptures of these creative and intelligent birds symbolize the connection between Banff’s urban landscape and the natural landscape of the national park in which Banff resides. 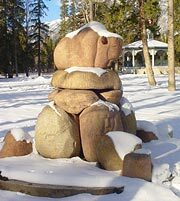 Found at the corner of Banff Avenue and Elk Street, in Rundle Parkette at 325 Banff Avenue, Mountain Camp is a delightful collection of bronze sculptures representing an historic campsite. 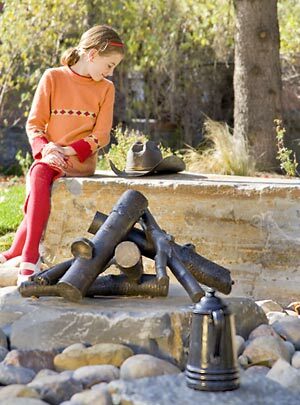 A pair of moccasins, a cowboy hat, and saddlebag in life-sized scale and exquisite detail lie on large boulder slabs around a bronze campfire and old coffee-pot. The camp could have looked just like one that pioneers in the Rockies may have used. It’s easy to imagine David Thompson, John Palliser, or Bill Peyto sitting here and warming their feet by the fire, sharing stories with their native guides. The work is designed to attract passers-by to sit amongst the pieces to rest and chat with each other, just as a cozy campsite would. 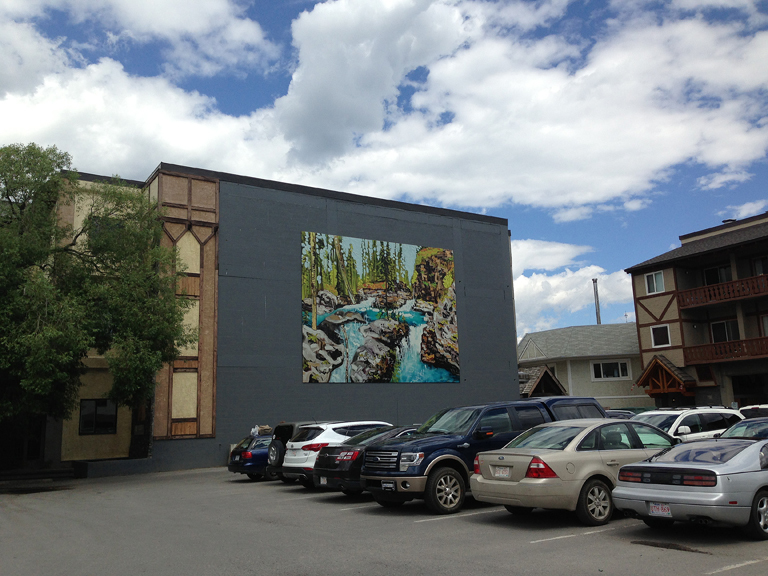 Banff's Community Art Committee went in a different direction in 2013 with the installation of temporary public art. The first piece was mounted on the exterior wall of the Bear Street Mall at 220 Bear Street. Artist Sheila Kernan's depiction of Johnston Canyon, titled When I Close My Eyes, was chosen following a nation-wide call for artwork. Keeping with the theme of temporary public art, three images were commissioned for installation on the back of Town Hall. Each image will spend 18 months on display at 110 Bear Street, visible from the alley, before being rotated out. The final image, Love Is Touching Souls by Roselina Hung was installed July 2017. Learn more about the piece from the artist. Found on the Bow River trail between the pedestrian bridge and Bow Falls, River Ribbon was installed in 2017 as a Canada 150 celebration piece.